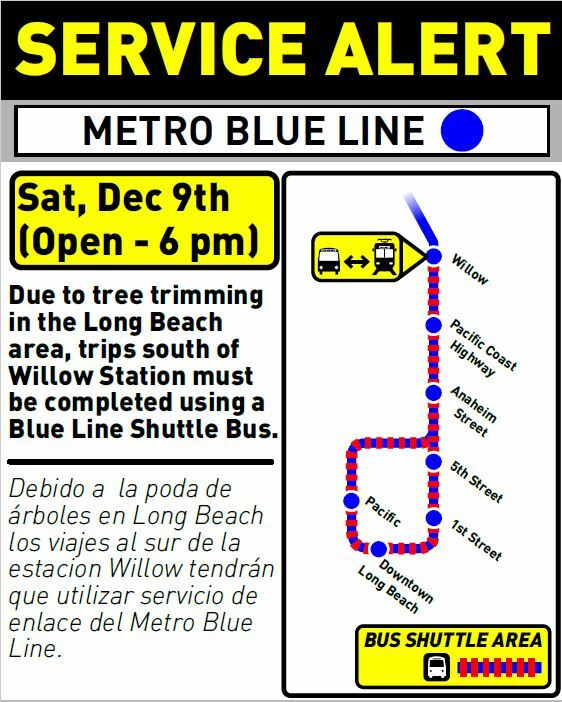 This Saturday, Dec. 9 from start of service to 6 p.m., there will be no Metro Blue Line train service south of Willow Street Station as the City of Long Beach will be performing tree trimming maintenance and other civil work adjacent to Blue Line tracks and stations. Free bus shuttles will replace trains between Willow Street Station and Downtown Long Beach Station during the closure. Blue Line trains are slated to run approximately every 12 minutes while work is in effect. The final stop for all southbound trains will be Willow Street. If you plan on using the Blue Line to get to Long Beach this Saturday, please allow extra travel time for your transfer between the train and bus shuttles. Metro personnel will be on scene throughout the day to lend assistance. Regular Blue Line train service is scheduled to resume Sunday, Dec. 10. Though we realize transferring to bus shuttles can be an inconvenience, the tree trimming work is necessary for public safety and helps prevent disruption to Blue Line operations. As always, we encourage Metro riders to follow us on Twitter @metrolosangeles or @metroLAalerts for transportation news and service updates. For route and schedule information visit Metro.net or call 323.GO. METRO. Saturday: Majority of the Blue Line is closed. :/ What a nutshell.